A lot of the natural substances we love today were initially made popular in ancient and traditional practices for both medicinal and cosmetic purposes. These substances have moved from being cultural staples to becoming worldwide favorites for modern health and beauty practices. A lot of these substances, however, don’t get the attention they deserve after being forgotten for so long. Sorrel, or Jamaican sorrel, may actually be better known to you as hibiscus flowers or flor de jamaica at Latin American food stores. It may also be known as red sorrel, rosella, or Florida cranberry, and it is scientifically or botanically named Hibiscus sabdariffa of the Malvaceae family. Year-round, sorrel blossoms are used to create an herbal tea that is dark red in color and has a tart and tangy taste that resembles that of cranberry or pomegranate. When the holidays come, however, sorrel tea is combined with spices, simple syrup, and Jamaican rum to create a seasonal punch. It is important to note, however, that Jamaican sorrel is very different from common sorrel. Unlike Jamaican sorrel, common sorrel is more of a leafy, green herb that is often grown as a garden herb or pot herb. Instead, Jamaican sorrel is actually not even a true sorrel, although its flavor does match the French and German origins of the word. The French word “surele” and the Germanic word “sur” can both be translated to the English word “sour”. The hibiscus flower, or sorrel, gets its sour or tangy taste from the element oxalic acid, which is similar to that of kiwis or strawberries. With that said, oxalic acid can actually be poisonous if it’s consumed in large amounts. However, if you only consume it in small amounts, it should be safe. While sorrel is mostly used for its strong, tangy taste, it is also used in many dishes and drinks for its significant health benefits. These benefits come from the many nutrients that can be found within the plant. For example, sorrel has very high concentrations of fiber and vitamin C.
Other nutrients include vitamin A, vitamin B6, iron, calcium, potassium, and magnesium. Other organic compounds include flavonoids, anthocyanins, and polyphenolic acids. Because it has a high hydrophilic capacity, referred to as its Oxygen Radical Absorption Capacity, Jamaican sorrel acts as a powerful antioxidant for the blood. In fact, it has a higher ORAC rating than favorable juices such as orange juice, tomato juice, and vegetable juice. It compares to levels found in cranberry or pomegranate juice. Its powerful nutrients give it great antioxidant and antimicrobial properties, which is one of the reasons why it is used as an ingredient in the very popular Essiac tea. Otherwise, they also provide many other significant health benefits, such as improved vision, regulated blood pressure levels, and better heart health. Sorrel is an excellent source of fiber and in case you needed reminding fiber is great for your health in particular your digestive health. Getting plenty of fiber into your diet can help add bulk to the stools making it easier for the stools to pass through your digestive system. This helps to make the entire digestive process more efficient and can help prevent common digestive issues like constipation, bloating and cramps. It can also help protect against diarrhea and stomach upset. As well as being great for the digestive system, studies have also linked inadequate intake of fiber with serious illnesses like cancer and heart disease. If you are looking to lose a few pounds, getting more dietary fiber into your system, can help. Not only does it improve the way your digestive system works but it can also satiate the appetite and make you feel fuller for longer. Snacking on high fiber foods like sorrel or drinking a sorrel drink can help reduce the amount you eat during the day and help you lose some weight in the long term. Generally speaking, Jamaican sorrel is often used as a blood thinner, a diuretic, and a way to lower blood pressure levels. Sorrel’s high concentrations of potassium allow it to regulate blood pressure levels and the balance of fluids throughout the body. These benefits would contribute to a healthier cardiovascular system by relaxing the blood vessels and arteries. When your blood pressure levels are lowered, your risk of developing heart disease or other similar conditions is greatly reduced, as well. Fiber can also help lower cholesterol levels and help reduce the risk of heart attacks, strokes, or atherosclerosis. Similarly, sorrel also has high concentrations of iron which can help to increase the production of red blood cells. As circulation increases with the red blood cells, oxygen levels in the body are increased, as well. This increase in circulation can help encourage hair growth, boost energy, and help heal wounds faster. The supply of iron also helps to prevent iron deficiency, otherwise known as anemia. High levels of vitamin C boost a healthier immune system, calcium helps to promote healthier bones, and vitamin A is an essential nutrient for normal bodily functions and preventing illnesses. Otherwise, sorrel has been known to help manage diabetes, likely due to the anthocyanin and organic elements that are present. The antioxidant properties of Jamaican sorrel could also help prevent cancerous cells from spreading by fighting and eliminating free radicals. Sorrel is a great source of vitamin C which is a natural antioxidant with a number of important health benefits. Vitamin C plays an important role in your skin’s health. It helps protect the skin from free radical damage and many of the signs of premature aging including wrinkles and fine lines. Sorrel contains a number of important minerals including calcium which is great for your bones and teeth. One cup of sorrel actually contains over 120 mg of calcium. As well as helping keep your bones strong and healthy and reducing the risk of osteoporosis, calcium plays a number of other vital roles in the body. Its functions include helping to transmit messages from the brain to other parts of the body. A deficiency in calcium is linked to bone weakness, osteoporosis and irregular heartbeat. Research has demonstrated that sorrel has a wide variety of powerful antioxidant compounds including flavonoids, polyphenols and anthocyanins. Antioxidants protect the body from the damage done to the cells by harmful free radicals. There is evidence that serious diseases like cancer are linked to free radical damage and that antioxidants like those found in sorrel can help prevent damage done to healthy cells and protect against the disease. It is important to detoxify our body every now and then to keep it functioning efficiently and to make sure that we stay as fit and as healthy as possible. Sorrel drink is considered to be an excellent choice for anybody that wants to detoxify their body and one that you can consume as part of an overall detox plan. Drinking sorrel juice is known to be good for the liver and kidneys and can help flush toxins from the system. 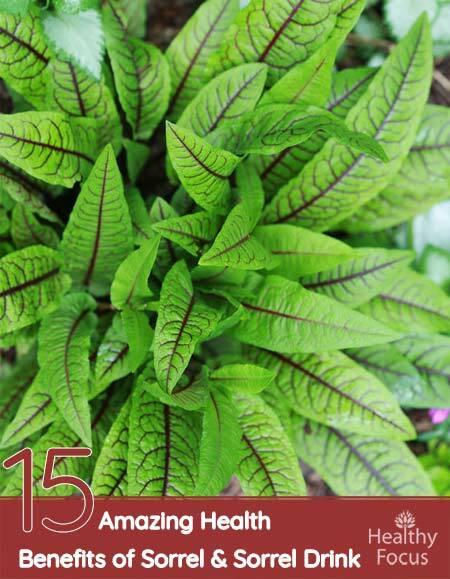 Studies have revealed that several types of sorrel are beneficial for the kidney. In particular, research has demonstrated that sheep sorrel and red sorrel leaves and juice can help treat kidney stones and flush toxins from the urinary tract. By drinking sorrel drink regularly, you can help treat kidney stones and prevent them from forming in the first place. Sorrel is also a good source of vitamin A and Beta-carotene both of which have been linked to an improvement in eyesight. Not only do these nutrients help improve your vision, they also help protect against macular degeneration and and reduce the risk of cataracts as we get older. Studies done on rats have also found that sorrel may have neuroprotective properties and could be useful in treating conditions such as Alzheimer’s and Parkinson’s disease. The researchers looked at the effects of phenolic compounds extracted from sorrel leaves and the results were very promising. Separate from its bodily health benefits, Jamaican sorrel can actually do a lot for the hair, as well. It may often be used as a way to dye the hair with natural ingredients. For example, combining it and bringing it to a boil with water and honey, then mixing it with cinnamon, could produce a liquid mixture to lighten red hair or give natural red highlights. Other benefits for the hair include strengthening, conditioning, soothing dry skin, and sealing the cuticles of the hair to prevent damage or breakage. Depending on your personal preference of what you’re looking to achieve, Jamaican sorrel can be used to create many different types of hair treatments. For example, you could also make it into a hair oil by crushing the petals and leaves and mixing them with a hot carrier oil like coconut oil, castor oil, almond oil, or any other base oil that works for your skin. After you’ve let it cook for around ten minutes and let it cool, strain the oil to remove the crushed leaves and petals. Use this oil in the same way that you would use any other oil for the added benefit of strengthening and conditioning that sorrel provides. Sorrel drink is a traditional holiday drink in many areas, but Jamaica made it most popular by spreading it to the rest of the world. In Jamaica, sorrel tea is mixed with traditional spices that taste like the holidays, such as cinnamon, ginger, and allspice. It’s also typical to add Jamaican rum to the mixture for a spiked version of the drink. Other popularly added ingredients include simple syrup (sugar and water), oranges, and pimentos. Spices and flavoring can be added or taken away to fit personal tastes, but the base guide tends to stay the same (sorrel tea, spices, and rum). The best thing is that you can use either dried or fresh sorrel, and its growing popularity means that you should be able to find it at many different types of food markets (not just the international ones). With that said, your local food market may have sorrel tea labeled as hibiscus tea. International food markets may also use different labeling terms. Latin markets will likely have Jamaican sorrel simply labeled as “Jamaica”, since that is what they call it in Latin America. Check the ingredients and do a little research to make sure you are getting what you’re looking for before you purchase. What are the health benefits of drinking sorrel? Sorrel contains a number of healthy nutrients and various medicinal properties including antioxidant, antimicrobial and anti-inflammatory actions. It is good for digestive health and is known to help reduce blood pressure and cholesterol levels making it a good choice for the heart. Sorrel can also boost immune health, improve circulation and is good for the bones and the skin. Is it safe to eat sorrel? Absolutely. Sorrel is not only edible but it is extremely good for your health and has a number of important nutrients and medicinal properties. What is the taste of sorrel? Sorrel has a distinctive tangy, sour taste because of its oxalic acid content. It resembles the tartness of cranberry and pomegranate. Oxalic acid is the same acid that gives rhubarb its tart flavor. What kind of drink is sorrel? Sorrel drink is a sour tasting dark red drink which is made from the sorrel plant’s petals. While the Jamaicans refer to it as sorrel drink it has other names depending on where you drink it. In West Africa, it is known as hibiscus flower while the Nigerians call it Zobo drink. In the end, it seems that Jamaican sorrel is more misunderstood than anything. Contrary to popular belief, it seems that Jamaican sorrel is not actually the same as the popular hibiscus flower. Instead, it’s actually a member of the hibiscus family. This could make it difficult to ensure that you’re purchasing authentic Jamaican sorrel since many manufacturers and retailers might not be labeling the products correctly. Regardless, there is certainly no doubt that Jamaican sorrel provides a lot of significant health benefits, and it makes a great holiday drink, too. If you’re looking to reap the benefits of sorrel or sorrel tea, it may be easiest to order the dried or fresh leaves online from a reputable company. It seems that many places offer them at a decent price, and they should be easy to find as long as you know what to look for. Do your research before purchasing any type of herb to make sure that it was grown organically and was never polluted with any chemicals or additives. A good way to make sure that the company you are purchasing from is reliable, especially if you’re buying online, is to read their past customer reviews to see what other people had to say about the product. If you’re unsure of how your body will react to Jamaican sorrel or if you have a health condition that you wish to treat with sorrel, speak with your doctor before attempting to use it in any way. Your doctor will be able to better determine whether it is safe for you to use Jamaican sorrel, as every person’s body is different. If your doctor does approve, you may also consider consulting with a holistic healthcare practitioner. These professionals would be able to better advise you regarding dosages and methods of application or consumption that best fit the results you are looking to see.